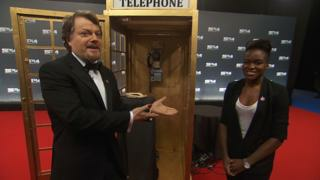 Olympic boxing champion Nicola Adams teamed up with comedian, multi-marathoner and Join In patron Eddie Izzard on the red carpet before BBC Sports Personality of the Year to say a 'Big Thank You' to karate instructor Andrew Turner who gives up his time to volunteer. Andrew has been running a karate club in Great Dunmow for over 30 years, alongside being the England and Great Britain junior coach and working as an airport fire-fighter. Throughout the evening, sports stars and members of the public from across the UK used #BigThankYou to give the unsung heroes at their local clubs the thanks they deserve during the Big Thank You weekend.